Quebec City shouldn’t look to a deficit-fighting federal government to help fund a new arena that would enable it to lure back a National Hockey League franchise, Treasury Board President Stockwell Day said yesterday. Day did allow that federal money could possibly go toward funding a new NHL-calibre arena. “Different municipalities have different plans in terms of infrastructure and I can’t comment directly on those plans,” he said. Boi-oi-oi-oing. Even after scouring the Internet, I haven’t found any indication of what the heck Day meant: That federal money could be used for arena infrastructure, but not for an arena itself? That Quebec City could use existing federal revenue streams, but not ask for new money? Any native Canadian speakers who can help me out here? In any case, it looks like the plan to lure the NHL back to Quebec with a new $400 million publicly funded arena is alive again. Or not. Day is saying that if Quebec wants to use federal infrastructure dollars that were earmarked for the city in the last federal budget then it would be ok. But he’s not going to give them money above and beyond what they’re already entitled to just to build an arena. This isn’t going to fly with Quebec because they will want that money to pave roads, fix water mains, etc. – you know, fix their infrastructure. 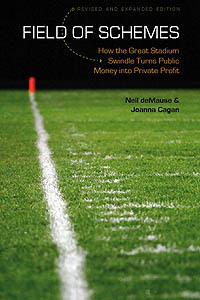 The problem is this is a departure for the federal government – since probably the mid 90s there has been no federal money available to construct new buildings specifically for professional sports teams in Canada (BMO field was built partially with federal money but that was for World Under 20 Championship and MLSE then scooped up the park and got TFC). Now that he’s opened this little pandora’s box you’ll see every team try to get its hands on some of that sweet federal money. Canadian politicians know that the public is strongly against funnelling tax dollars to pro sports teams. So they create programs for ‘infrastructure’, like roads, sewers, social housing etc. But they tend to put no restriction on how local municipalities use the money. So QC could take $400m destined for a hospital renovation, for example, and spend it on luxury suites and a private helipad for wealthy sports fans (or, you know, sponsors). JB has it; Day’s meme is that of federal politicians (those to form gov’t) tell rest of Canada one thing and deliver the moon for votes out the backdoor. Especially since Quebec city is the only place were Day’s govt can court realistic votes. The other objective could be to hint-hint to QC that they better attach their arena plan to hosting some kind of international competition, eg World junior championships, Francophone Games etc. Just another lying politicians, in other words. The mayor want a new building and the new quebec mayor is realy popular in quebec city. The mayor regis labeaume want 175 millions from the 2 gouvernements and quebec city will give 50 millions. the dead line is decembre 31 2010. Because the mayor want the winter olympics. Tovay the mayor visit the prime minister of the quebec jean charest.